Nelson Mandela was a South African anti-apartheid revolutionary, civil rights hero and martyr who claimed victory in his lifetime crusade to establish a non-racial democracy for South Africa. He was arrested as a political prisoner in 1962 and spent 27 years in prison, released in February 1990. He was awarded the Nobel Peace Prize in 1993 and became the nation’s first black president in May 1994. His government focused on dismantling the legacy of apartheid through tackling institutionalised racism, poverty and inequality, and fostering racial reconciliation. The events of his extraordinary life while staggeringly powerful in themselves do not do full justice to the true standing of Mandela. He was a global icon. If a poll was taken worldwide to establish the individual who made the most positive contribution to humanity in the 20th century, few people would gain more votes than Nelson Mandela. It’s only natural that Mandela was born with the Sun in Cancer as he was the true founding father of the South African Rainbow Nation and the whole country, black and white was his family. Internationally, Mandela was the Secretary General of the Non-Aligned Movement from 1998 to 1999 and he used his global influence to support many humanitarian and reformist movements throughout the world. His protective Cancer Sun extended to put an arm round the whole of humanity. Few people could have lived a life of such extremes. Being sentenced to life as a terrorist and spending 27 years on Robben Island much of the time in solitary confinement, to emerge and become President of the nation that imprisoned him is the most extraordinary story. It is the equivalent of sinking to the deepest and darkest part of hell to rise phoenix like to the gates of heaven. Only one astrological sign would permit such possibilities within one life and that would be Scorpio and of all the planets the one that would go deepest in that sign would be the Moon. 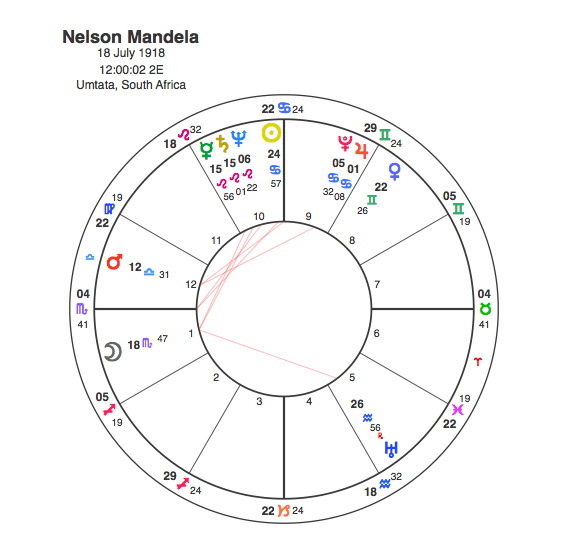 Nelson Mandela had the Moon in Scorpio. Mandela’s Sun and Moon were in flowing, harmonious trine aspect showing that these two definite themes in his life were beautifully connected, one could not have occurred without the other. The Sun shares Cancer with a conjunction between the noble Jupiter and revolutionary Pluto. Mandela was born into the Thembu royal family. The major theme in Mandela’s life was shown by a T Square. Mercury is conjunct Saturn in Leo showing someone who came from a traditional ( Saturn ) royal ( Leo ) background. Mercury and Saturn are opposite the rebellious Uranus in the sign of political idealism and change, Aquarius. An opposition between planets in Leo ( leaders ) and Aquarius ( rebels ) is very common amongst leaders of revolutionary groups. This opposition focuses onto the apex Moon in Scorpio showing that this particular rebel leader would be forced in his own personal hellhole. There is no definite birthtime available for Nelson Mandela and so his chart is constructed for noon. In the absence of a birthtime many renowned astrologers have come up with a rectified time of around 3.00 pm. This would produce a chart that seems to fit quite well as it would place the Sun in the 8th house reinforcing the incredible highs and lows of his life and his own powerful ability to transcend his problems and reinvent himself. This birthtime would also place the Scorpio Moon on the cusp of the 12th house and this house traditionally rules prisons so the symbolism works quite well. Mandela began his secondary education at a Western-style institution that was the largest school for black Africans in Thembuland in 1935. This move made him socialise with other students on an equal basis, and he claimed that he lost his “stuck up” attitude, becoming best friends with a girl for the first time. This was an important turning point for Mandela as Pluto was conjunct his Sun at the time. In 1950, Mandela was elected national president of the ANCYL. In 1951 Mandela altered his entire perspective, embracing a united racial front, and influenced by the Soviet Union’s support for wars of independence, Mandela’s mistrust of communism also broke down. He became influenced by the texts of Karl Marx, Friedrich Engels, Vladimir Lenin, Joseph Stalin and Mao Zedong, and embraced dialectical materialism. Pluto moved into Mandela’s T Square in 1950 – 51 conjunct Mercury and Saturn for this radical change in his thinking ( Mercury ) processes. He rose to national prominence in the ANC’s 1952 Defiance Campaign when Pluto was square the Moon. He was repeatedly arrested for seditious activities during the period when Pluto was opposite Uranus, 1955-6. Mandela was imprisoned in 1962 at a time when no obvious transits were happening. This is such a significant event that it would have to be indicated by a major transit. Capricorn Research does not generally do rectification as it is unscientific but as Mandela was an exceptional man it is appropriate to make an exception. A birthtime of 9.25 am would give Nelson Mandela a Virgo Ascendant. This does seem more appropriate than the Sagittarius rising given by the 3.00 pm charts. Most people that have met Mandela have remarked how humble he was as a man despite his great fame. Humility, a strong concern for the downtrodden and a desire that other people should take the credit for his own work are classic Virgoan traits. It certainly does not fit with Sagittarius rising which would if anything tend to exaggerate his own importance in the general scheme of things. This time would also place Pluto on his Ascendant at the time he was imprisoned. It would also place his Sun in the 11th house of political ideals but more significantly for someone who would go on to become such a much loved and revered President he would have Venus, Jupiter and Pluto in the 10th with Venus conjunct the Midheaven. Capricorn Research does not hold strongly with the idea that the 12th is a house of retirement and imprisonment. This is certainly not backed up by the fact that 20000 plus public figures have the Sun more frequently in the 12th house than any other. It seems that other rectifiers have tried very hard to make the 12th house connection when such a chart shows nothing in the 10th house which is unlikely for someone who rose so high. The most significant transit of Mandela’s life occurred in 1990 when he was finally freed from prison. Pluto was conjunct the powerful apex Scorpio Moon and he was delivered from hell. Within a year he was elected President of the ANC and within 4 years President of South Africa. In a way this watershed backs up the rectification chart. Pluto went over Mandela’s Ascendant in 1962 taking away his personal freedom. In 1990 he was freed so Pluto on the Moon in the 3rd house gives him the freedom to move around and communicate with other people ( 3rd house ). 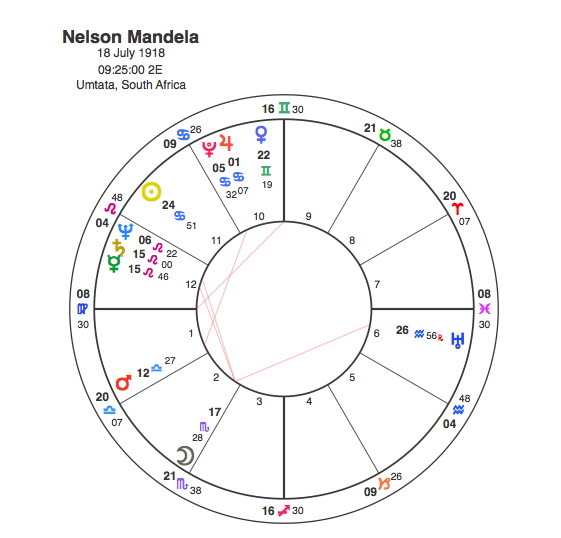 The other transit that confirms the issue is in 1999 when Pluto was square Mandela’s Ascendant, his time in office as President came to an end. In the end Old Father Time Saturn took Mandela from us as it was conjunct his powerful Scorpio Moon in December 2013. May it serve to give him as much release as when Pluto did the same thing in 1990. By any measure, Nelson Mandela was a great man, possibly the most powerful force for good in the last 100 years. To lose him at the age of 95 is sad, but to have witnessed his life was utterly inspiring.